When Ella’s mother dies, she wishes for her dad to remarry, so she can have a mother’s influence in her life. She doesn’t consider the fact her stepmother might have daughters of her own. These two greedy girls take over Ella’s room, forcing her to sleep by the hearth, and she often ends up sooty. Before long, she’s known as CinderElla. When the Prince holds a ball, the stepsisters can’t wait to meet him. Being married to a Prince would ensure that their needs for lots of clothes and jewels would be satisfied. CinderElla just longs to be her mother’s daughter for the evening, and her wish is granted by the stars. But all good things come to an end, and she rushes from the ball, leaving one shoe behind. 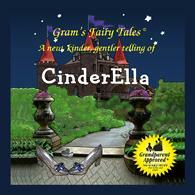 Gram’s Fairy Tales are a kinder, gentler retelling of the original stories. Although the stepmother in this new version isn’t mean, it’s hard to see much good in these materialistic stepsisters. But in light of their behavior, CinderElla’s goodness shines through, capturing the heart of her Prince.